Extreme Killing offers you a comprehensive overview of multiple homicide, including both serial and mass murder. Filled with classic and contemporary case studies, this fully updated Fourth Edition reflects a growing concern for specific types of multiple homicides—indiscriminate public massacres, terrorist attacks, hate crimes, and school shootings—as well as largely debated issues such as gun control and mental illness. 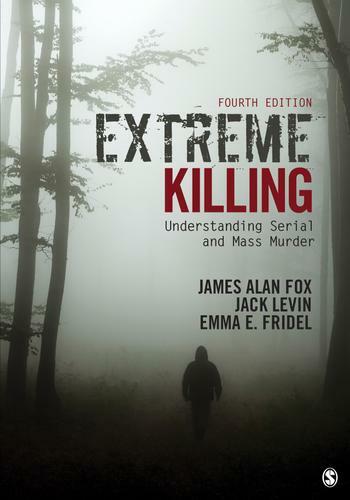 Renowned experts and authors in the field, James Alan Fox, Jack Levin, and Emma Fridel bring their years of research and experience to create distinctions between serial and mass murders, address characteristics of both killers and their victims, and recognize the special concerns around multiple murder victims and their survivors. You will examine the latest theories of criminal behavior and apply them to mass and serial murderers from around the world, such as the mass shooting at a country music festival in Las Vegas, the Grim Sleeper in Los Angeles, the Pulse nightclub massacre in Orlando, the shooting of nine African Americans by a white supremacist in a Charleston church, and more.